COLUMBIA, Mo. ­— University of Missouri Interim Provost Ken Dean announced today that Dean Mills, dean of the MU School of Journalism, will retire effective Aug. 31, 2014. Mills, who has served in this position for 25 years, is the longest current serving dean at MU. 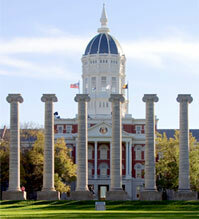 The school’s first online master’s degree program was launched. The American Society of News Editors and the National Freedom of Information Coalition moved their headquarters to Missouri. Mills began his academic career at the University of Illinois, where he completed a doctorate in communications in 1981. He has served on the faculties of the University of Mississippi, the University of Illinois and California State University, Fullerton. Before coming to Missouri as dean in 1989, he served as director of Pennsylvania State University’s School of Journalism and as coordinator of graduate study in communications at California State University, Fullerton. He also has bachelor’s degrees in journalism and Russian from the University of Iowa, and a master’s degree in journalism from the University of Michigan. Before entering higher education, Mills worked as a professional journalist. He served as Moscow Bureau Chief for the Baltimore Sun from 1969 to 1972. From 1972 to 1975 he was a Sun correspondent in Washington, D.C., where he covered the State Department during the Kissinger era, the Watergate scandal, the resignation of Vice President Spiro T. Agnew and the Roe vs. Wade Supreme Court decision. In 2012, Mills was inducted into the Missouri Newspaper Hall of Fame. He received a similar honor in 2013 when he was inducted into the University of Iowa School of Journalism and Mass Communication’s Hall of Fame. In 2005, he received the Manuel T. Pacheco Academic Leadership Award. The award was created in 2002 and is presented to an academic administrator who exemplifies outstanding academic leadership at the University of Missouri. Pacheo was a former UM President who was recognized as a leader who exhibited humility and respect for others, and worked diligently to develop leaders around him. Following his retirement as dean, Mills will work half-time as director of the Reynolds Fellows program at the School’s Donald W. Reynolds Journalism Institute. The Institute gives both residential and non-residential fellowships each year to journalists and scholars who work on new approaches to journalism. His research interests include international journalism, journalism ethics, cross-cultural journalism and qualitative research methods. Mills is an author of a Ford Foundation study on race and the news and a book on cross-cultural journalism, Journalism Across Cultures, that he co-authored with Missouri School of Journalism colleagues Fritz Cropp and Cynthia Frisby. He also authored a book on journalism in Eastern Europe in the post-Soviet era. The university will begin a national search for Mills’ replacement immediately.